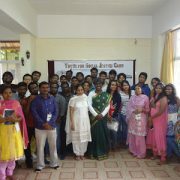 Greetings from the Commission on Youth (COY) of the National Council of Churches in India! At the outset, I on behalf of the 4 million youth of the Protestant and Orthodox Churches in India would like to convey our congratulations to you on your taking over the office of the Prime Minister and we look forward to your programmes for especially the weakest in our society. 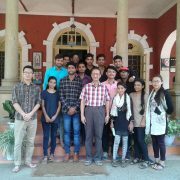 The National Council of Churches in India (NCCI) is the apex body of the Protestant and Orthodox Churches in India representing more than 14 million people around the country. The NCCI along with its constituent members viz, 30 member churches, 17 Regional Christian Councils, 17 All India Christian Organizations, 7 Related Agencies and 3 autonomous bodies is celebrating its Centenary this year and has for the past 100 years through its work, contributed to nation building in various ways especially through Education, Health care, relief and rehabilitation, Youth and Women Empowerment, Empowering Dalits, Tribals and Adivasis, Peace initiatives and the like. The values such as Justice, Peace, Integrity, Love, Unity, promoted and strengthened by the NCCI have contributed to significant have significantly benefited the nation. The NCCI is committed to working with vulnerable communities and marginalized groups of all faiths and ideologies, particularly with Christians. Through its various programmes and activities, the NCCI has contributed leaders to the nation and the society who have envisioned and worked for change in the society, its values, and its standards. The NCCI has stayed committed to working with the Youth, Women, Dalits and Tribals/Adivasis. The concerns of Youth is one of the major focuses of NCCI and through its Commission on Youth it has encouraged, empowered and created platforms for young people to openly express their interests, and visions for a new India. 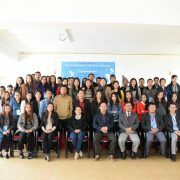 The Commission on Youth, since its inception has journeyed along with the young people of the country bringing them closer to the opportunities the country offers to them, moulding them to be responsible leaders, leading them in the paths that they chose to be in, ensuring support to them through scholarships, and its internship programme and other programmes that the Commission on Youth offers. After the elections and you being selected as the New Prime Minister of the country, there were many open letters written to you both appreciative and critical, about people’s grievances, and about their expectations from the new government. The strengths, weaknesses, opportunities and threats of the new government are being analyzed by various political parties, religious leaders, common people, the youth, women etc. Many people from around the country have appreciated your strong speech in the Lok Sabha, your committed outlook and your interest in changing the face of the nation. We the youth of the country constitute approximately 66% of the entire population and are the majority in the nation and India is set to become the world’s “youngest” country. However as youth, while we are the majority, we are considered as a minority; our needs, interests, and aspirations are considered to be the least important and are rarely respected. When you said that you would like to transform “Scam India to Skill India”, please remember that skill rests in the youth of the country; the potentials of the young people need to be utilized with proper recognition. Youth are the pillars on which the nation stands, we are not the future, we are the TODAY of the nation. We, the young people of the country would like to request you and the new government to take steps to listen to our voices, our vision for a transformed nation and respond accordingly. We, the youth of the country would like to see a country which is free from communal and racial violence. Such violence in the past has created havoc in the country and has disturbed the secular nature of the country and disturbed and destroyed the lives of the young people. Any form of communal and racial violence that disturbs the tranquility of people following their religious beliefs and faiths needs to be condemned and demands swift intervention by the state to protect especially the minorities. We, the young people urge the government to take severe actions against those perpetrators of violence against women, especially young women whose day to day security is at risk. Young women of our nation have come out of their restricted places to exercise their freedom, their right to utilize their skills in a free and safe environment. In such a context the controversial statements made by many political leaders regarding women has created fear in the minds of the people about the security of women. Please take stern action against those leaders who undermine the right to dignity and justice of young women of the country. The respect and rights due to women needs to be defended. Make sure that the government at a whole and every institution and office develops a binding policy and a team to fight sexual harassment. We, the young people want to see a nation that is free from corruption; corruption has killed many young people in the country. The bribes that are demanded in different forms and in various names by organizations, institutions, offices, schools, colleges have denied young people their right to education and right to employment. Corruption in the form of bribes needs to be strongly condemned and measures should be taken to wipe out the culture of corruption that has emerged even in the smallest of offices in villages and government organizations everywhere. Corruption happens in a context where poverty is a reality in the lives of many young people, pushing them into further vulnerability. We, the young people advise the new government to take measures to stop suicides and murders of young people in institutions, colleges, schools, offices and villages based on caste. Caste has been a major threat to young people from the backward communities. Dalits are the victims of many forms of violence in the country and to add to that, they are being humiliated in colleges, institutions, schools etc. The rules of conduct of educational institutions provide drastically different norms for Dalits and for people of other caste groups. We, young women and men want you to ensure that caste discrimination is annihilated in the country, giving space for both Dalit women and Dalit men to enter into offices that they are interested in. Discrimination based on Caste has been practiced by many people in different ways as an example I cite the prohibition imposed by the newspaper “The Hindu” on their staff from eating or bringing non-vegetarian food to the office. Vegetarianism is part of caste politics that is being imposed by even a reputed news paper like “The Hindu” is distressing. The murder of Dalit girls and boys for marrying people of other castes is the other tale of victimization of the Dalit communities. Stringent laws should be made to ensure that the dignity of Dalits is respected. We would like to bring to your notice the recent discussion regarding sexual minorities. We appreciate the landmark judgment of the Supreme Court on creating a third gender status for transgender communities. The delay in the promulgation of this judgment has been the reason of many transgendered people suffering severe discrimination within their homes, religious places, organizations, institutions, etc. ; some have even lost their lives. We urge the government to take serious and swift steps to safeguard the rights of the LGBT communities who suffer various forms of discrimination in society. We demand that the government rethinks its development policy in the country. ‘Development at whose cost?’ is the question that we young people would like to ask. Development projects have displaced lakhs of people for the benefit and comfort of the powerful. As you start to rethink about the progress of the nation, we expect you to make sure that the rights of the people are addressed before eulogizing development. We appreciate your assurance that no one will have to leave the villages as you will ensure that development reaches them. We request the government to start projects to save the environment. Climate Change is a serious concern in the present and many people have already undergone much suffering because of climate change and global warming. Urgent measures need to be taken to ensure a safe earth for the coming generations. We demand that youth be given a dignified role in decision making in the nation. We rarely find young people in the Parliament or in decision making bodies. Efforts should be made to recognize the capacities of young people in making decisions that are transformative of the society and the nation. Please listen to the voices of the young people. Young people want change in the country. Their votes carry with them their aspirations for a country of justice, and dignity for youth. The youth expect that the rights of the young women and men be they Dalits, Tribals, disabled, HIV infected and affected, sexual minorities or migrants, be defended without compromise. 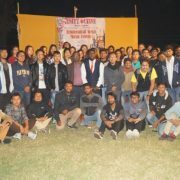 Youth envision a nation free from corruption, a nation with job opportunities for youth, respectful space for youth in politics and in decision making bodies, a nation in which the SC/ST reservation status for Dalit Christians and Muslims is ensured. We expect the new government to substantiate their good intentions in this regard by bringing about the necessary changes. We hope and pray that God will give you wisdom to discern what is right and responsible, and that you will make every effort to safeguard the interests and needs of the vulnerable communities in the Nation. Please be assured of the support of the Commission on Youth- NCCI to the new government in its efforts to engage youth for Justice and Peace. All the best Mr. Prime Minister. 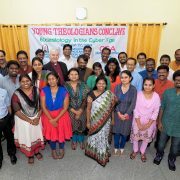 Report of YOUNG THEOLOGIANS CONCLAVE "Ecclesiology in the Cyber Age"